Gainesville Dental Associates is using a new digital scanning system, the iTero Element Intraoral Scanner to provide detailed and accurate digital impressions of the teeth and gums. We believe this scanner will help us better serve our patients. Gainesville Dental Associates announced this week that they are using a new digital scanning system, the iTero Element Intraoral Scanner. 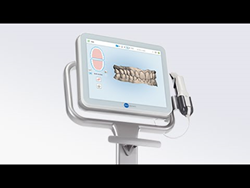 The iTero Scanner provides detailed and accurate digital impressions of the teeth and gums. This makes it possible for dentists at Gainesville Dental Associates to create an effective treatment plan for straightening their patient’s teeth. Until recently, teeth straightening required multiple putty-based impressions to be made before treatment could begin. The iTero Scanner eliminates this need. The iTero Scanner works quickly and efficiently to make accurate impressions of the teeth and gums. Patients are able to breathe and swallow during scanning. The scanning process can even be stopped when necessary. The impressions made by the scanner can be used to create a 3D model of the mouth. This model can be used to determine the most effective orthodontic treatment plan. The iTero Scanner includes an Outcome Simulator. This simulator can show patients what the results of Invisalign treatment might look like for them. This innovative system makes it possible for patients to make a decision based on their individual results. No other dental technology can provide that service. Invisalign aligners provide a discreet, effective and comfortable way to straighten the teeth. The clear aligners can be removed when eating or brushing. Invisalign aligners straighten teeth much faster than traditional braces. Most patients achieve their desired results in as little as one year. Gainesville Dental Associates offers quality cosmetic, preventative and restorative dental services in Gainesville, VA. The practice was voted as the #1 Dental Practice in Gainesville, VA by the Washingtonian, Haymarket Lifestyle and Northern Virginia magazines. Their experienced team receives ongoing training to ensure they are up-to-date with the latest dental techniques. Their dental office is designed to be comfortable and relaxing. For more information about Gainesville Dental Associates, please visit their website at http://gainesvilledentalassociates.com.